Six top law students have joined Bricker & Eckler for the 2018 summer associate program. Throughout their time with the firm, they will have an in-depth learning experience that provides exposure to the legal profession. They will do real client work, collaborate with practicing lawyers and participate in community service projects. The 2018 class includes Dan May, Chris Page, Amy Riedel, Aaron Rothey, Allie Soisson and Graeme Sua. Dan May attends The Ohio State University Moritz College of Law. A Diversity Enrichment Scholar, he will be graduating in May 2020. Dan earned his B.A. in Political Science at Denison University, where he served as a fellow for the Political Science Department. During his time at Denison, he received the Tyree Parajon Scholarship and served as the Delta Chi Fraternity president and recruitment chair. He has experience as a product department intern and a financial institutions division intern with American Modern Insurance Group. Chris Page attends the University of Nebraska College of Law, from which he is expected to graduate in May 2019. While attending law school, he has served as a board member of the American Constitution Society and as the master of the ritual for Delta Theta Phi legal fraternity. Chris is currently vice chair of the Nebraska Moot Court Board and a member of the Nebraska National Moot Court Team. Additionally, he placed third in Nebraska Law’s First-Year Client Counseling Competition and was a semi-finalist in the University of Nebraska College of Law's Allen Moot Court Competition, in which he and his partner received the best brief award. Chris earned his B.A. in Public Affairs from the John Glenn College of Public Affairs at The Ohio State University. During this time, he was honored as a Morrill Excellence Scholar, a SPHINX Senior Class Honorary and with the 2016 Outstanding Undergraduate Policy Paper Award. Chris has worked as a law clerk for Erickson & Sederstrom P.C., L.L.O. and has previous experience with the Ohio Education Research Center as a student communications specialist. Amy Riedel attends The Ohio State University Moritz College of Law, and will be a May 2019 graduate. She is a Tillman Scholar and a fellow for the Grassbaugh Veterans Project. In 2017, Amy served as a Judicial Extern for Chief Justice Maureen O’Connor and was most recently a legal and compliance intern for Abercrombie & Fitch. Additionally, she worked with Ohio State Law Professor Dakota Rudesill as a research assistant. Amy earned her B.S. in History at the United States Naval Academy. Upon graduation, she worked as the Maintenance Division Officer for USS Pearl Harbor. She then moved to Assault Craft Unit Five, where she headed the ground operations and safety department and then as the officer in charge of operational event scheduling as well as public affairs officer. Amy also served as an administrative specialist for the Naval Academy in Waterfront Readiness before working for Georgetown University Medical Center. Aaron Rothey attends The Ohio State University Moritz College of Law, from which he will be graduating in May 2019. Aaron has been honored as a Moritz Merit Scholar and is the executive note editor for the Ohio State Law Journal and has actively participated in the Moot Court Program. Prior to law school, he earned a Master’s of Education degree from Ohio State’s College of Education and Human Ecology, as well as a Bachelor’s degree in English with honors from Ohio State. Aaron has experience as a law clerk with the Columbus City Attorney’s Office Zone Initiative Team. He also worked as an English teacher at Logan Elm High School where he taught 9th-11th graders in standard, honors and Advance Placement classes. During his four-year teaching career, he advised several clubs and organizations, including drama club and the chess and game club. He also served as the director of the high school’s spring plays. Allie Soisson attends the University of Cincinnati College of Law. She is expected to complete her law degree May of 2019 with Dean’s Honors. Allie is a Michael J. Burke Memorial Scholar, is managing editor of law review and is on the executive board of mock trial. Allie received her Bachelor’s degree in American Studies from the University of Notre Dame. Upon completion of her undergraduate schooling, she worked as an eighth-grade teacher in Houston, Texas, and was recognized as an outstanding Teach for America 2014 Corps Member. Allie has gained legal and research experience in multiple volunteer and employment roles, including as part of the Notre Dame Mock Trial Association, the Snider Endowment for European Studies and the Notre Dame Institute for Global Development. She was also a summer associate with Musillo Unkenholt in Cincinnati. Graeme Sua attends The Ohio State University Moritz College of Law, from which he will be graduating in May 2020. He is an active member of the Black Law Student Association and a Wieler Real Estate Scholarship recipient. As an undergrad, Graeme earned dual degrees in political science and journalism from the University of Wisconsin-Madison. He previously worked as a campaign intern for U.S. Senate and gubernatorial campaigns, aiding in volunteer and donor recruitment. He was also a legal intern for McCallister in Kansas City, Missouri. 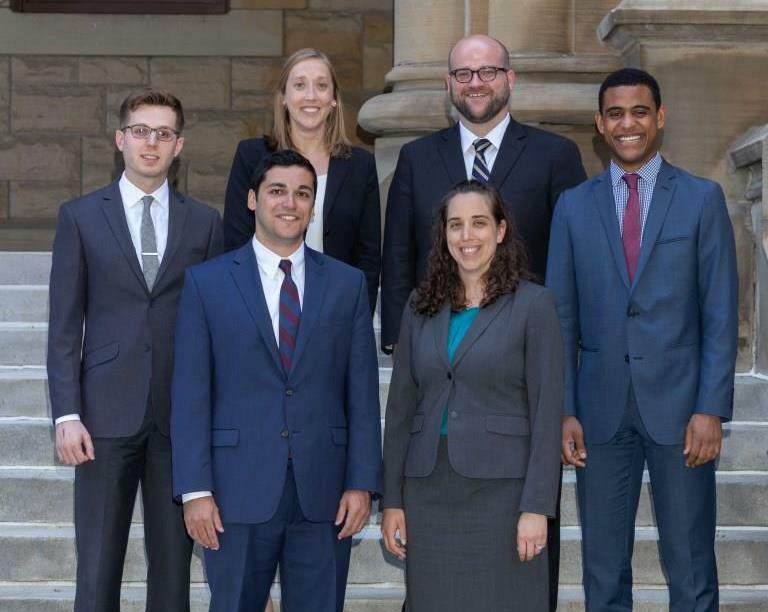 (L-R) Chris Page (The University of Nebraska College of Law), Dan May (The Ohio State University Moritz College of Law), Allie Soisson (The University of Cincinnati College of Law), Amy Riedel (The Ohio State University Moritz College of Law), Aaron Rothey (The Ohio State University Moritz College of Law) and Graeme Sua (The Ohio State University Moritz College of Law).